Unique; No other kit like this exists on the market. High Performance; Each product has been developed to answer the most stringent needs. Superb Quality; Each product has been researched, tested thoroughly and meets all EU safety regulations. The Intelligent Pelican travel kit contains the 6 essential top quality items. 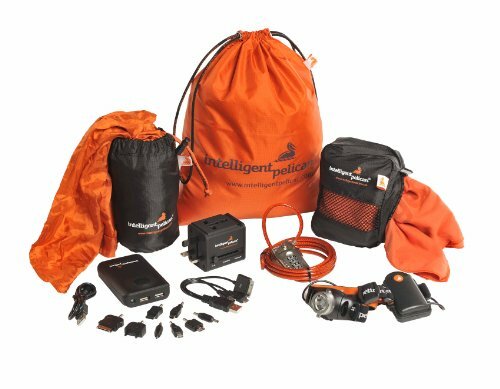 In the kit you will find a LED Headlamp with 40m beam; a 4 digit combination lock and integrated 4mm steel cable; an all in one universal adaptor for use in 150 countries with 2 USB outlets; a 100% rip-stop silk sleeping bag liner treated with anti bacterial and mosquito protection; a large lightweight quick-dry travel towel, super absorbent, soft and treated with anti-bacterial agents; .a portable 6 hour external charger for mobiles, MP3, camera and iPad. Each product comes in a black rip-stop silk water resistant bag, there is also a large orange rip-stop silk bag supplied for easy storage.